Italy must choose between the rule of law and the rule of mobsters. The far-right violence on the streets of Torre Maura has set a dangerous precedent. While in this instance the neo-fascist CasaPound has claimed a victory against “ethnic substitution”, the blame for the wider upsurge in anti-Roma violence lies squarely with interior minister Matteo Salvini. 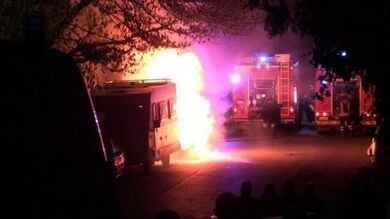 “Those bastards must burn" – On Tuesday April 3, a screaming 300-strong far right mob, set fire to dumpsters and a car service centre to prevent the placement of 70 Roma in a local reception centre in the rundown Torre Maura suburb of Rome. In the face of the violent protests, backed by neo-fascist groups CasaPound, Forza Nuova and Frontal Action, the municipality announced that the group of Roma which, according to la Repubblica includes 33 children and 22 women, will be moved to other city facilities "within seven days". Forza Nuova, which declared itself "Ready to barricade against ethnic substitution", was quick to exploit local discontent about the lack of services in this neglected district of Rome, and riot police were forced to intervene as the crowd blocked firefighters at the scene. Earlier in the afternoon the crowd seized and trampled sandwiches and snacks intended for the Roma, shouting, “They must die of hunger”. 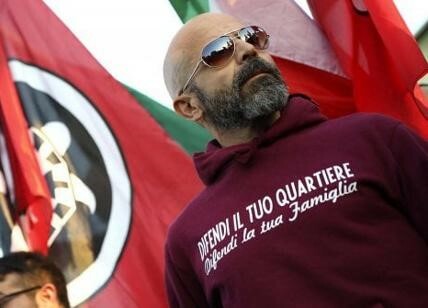 Giuseppe Di Silvestre from CasaPound (pictured above) described the decision of the municipality to relocate the Roma as a great victory and warned, “If they do not keep their word, we will return to the street alongside the citizens". Forza Nuova announced “a permanent garrison from 7 pm on Wednesday until the last Roma has left". From the man who tweeted "So many enemies, so much honor," one of Benito Mussolini's favorite sayings to mark the late dictator’s birthday, Matteo Salvini’s comment “No to any form of violence” convinces no one. Especially given that the number of racially motivated attacks has tripled between 2017 and 2018, when his far-right League became coalition partners in government. Little wonder that neo-fascist groups feel emboldened in the wake of Matteo Salvini’s swift ascent to become the most powerful politician in Italy. Just over one month ago Italy’s intelligence agency warned that attacks on migrants and minorities could rise in the run-up to May’s European elections. 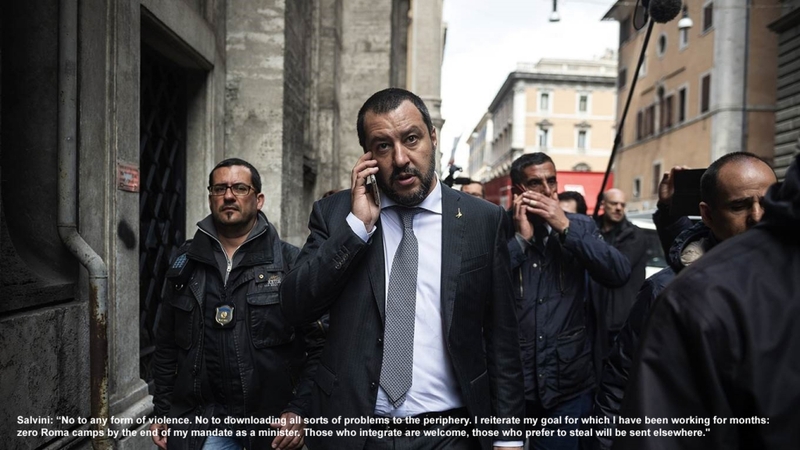 The intelligence agency report said the Italian far right was characterised in 2018 “by a pronounced vitality” and an increase in xenophobic propaganda “focused on the opposition to migration.” It warned that there was “a real risk of an increase in episodes of intolerance towards foreigners”. In January, the European Committee of Social Rights (ECSR) repeated its concerns about the climate of racism in Italy, “particularly with regard to racist misleading propaganda against Roma and Sinti indirectly allowed or directly emanating from the authorities”. Salvini openly encourages a climate of hatred, and without a doubt his “racist misleading propaganda” has emboldened neo-fascists to take direct action against Roma, migrants and other minorities. As Salvini’s predecessor, Umberto Bossi put it approvingly a decade ago in the wake of anti-Roma pogroms in 2008, “People do what the state can’t manage”. As we have stated before, Salvini’s disregard for the rule of law, his virulent nativism and racist determination to scapegoat the Roma and other minorities smells like fascism. Make no mistake Salvini and his ilk spell real danger for Italy and for Europe. The authoritarian axis is mobilising its forces across the continent for the forthcoming European elections, and its currency is racism, hate and fear. Related article: Smells like Fascism: Antigypsyism in Italy and the Scourge that is Salvini. https://bit.ly/2VlLSTr. For more information on anti-Roma violence check out our fact-sheet, Mob Justice: Collective Punishment Against Roma in Europe.